NOTE: This Ver. 4 AccuLevel™ has 2 modes of operation. 1) In Normal angle measurement mode the display is steady. 2) In Caster Mode the display flashes (and will not measure absolute angles). Push CASTER button to exit Caster mode and go back to Normal angle measurement. Zero: Acculevel™ maintains its zero when shut off and DOES NOT REQUIRE ZEROING. Compare one angle to another: The ZERO button is ONLY used to compare one angle to another. Place AccuLevel™ on a surface and push ZERO. The display will go to 0.0. Move to a different surface to compare the difference. Push ZERO again to return to normal use. To hold a reading: Push HOLD and release. The display will show H and flash. When H stops flashing (approx. 5 sec.) the reading is held on the display. Push HOLD again to go back to active reading. NOTE: AccuLevel™ MUST be held absolutely steady during this 5 seconds. To calibrate: Place AccuLevel™ on a reasonably level surface (does not need to be perfectly level - a table is OK). Turn on, then push ON/OFF again and hold for 5 seconds until unit shuts off. Turn unit on again and -1- will appear on the display. Now push ZERO. -1- H will begin to flash and in a few seconds -2- will appear. TURN UNIT AROUND 180° IN THE SAME SPOT and push ZERO again. -2- H will begin to flash and in a few seconds normal readings will reappear. Calibration is now complete. Caster: (CASTER) AccuLevel™ will display front suspension Caster when used in a specially designed Caster/Camber gauge (click HERE or see Longacre catalog). See gauge instructions for details. 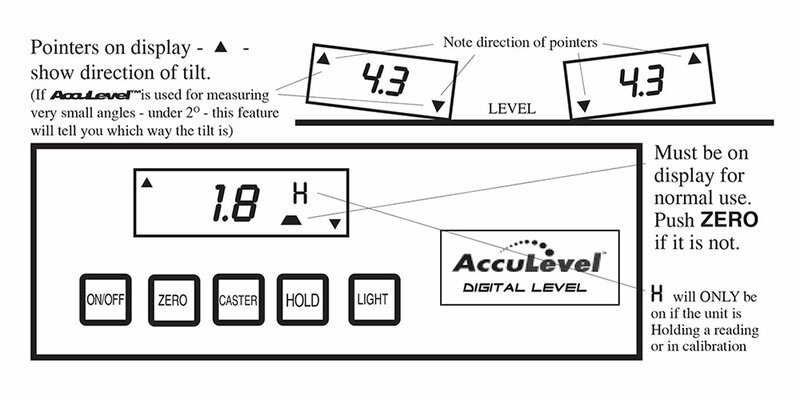 Display backlight: (LIGHT) AccuLevel™ Version 4 has a display back light. Push LIGHT. DO NOT DROP THE UNIT. Keep clean and dry and avoid strong magnetic fields. Do not push 2 buttons at once. If it will not be used for several months remove the batteries.